I don't want thunder thighs but my favorite place right now is the kitchen. Here's a quick makeover for sausages. Sprinkled lots of pepper, parmesan cheese, and garlic powder over these sausages. 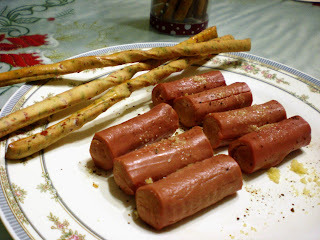 Popped them in the microwave and served with cheddar cheese and bread sticks from Delifrance. Last night I made a simple Italian sandwich but the photo got deleted, will make it again sometime and take a snap. It's bread brushed with olive oil, topped with slices of cheese (mozarella is best), tomato, parmesan, pepper and salt. Heaven!